The core of the Club Monaco ethos revolves around a celebration of the individual. 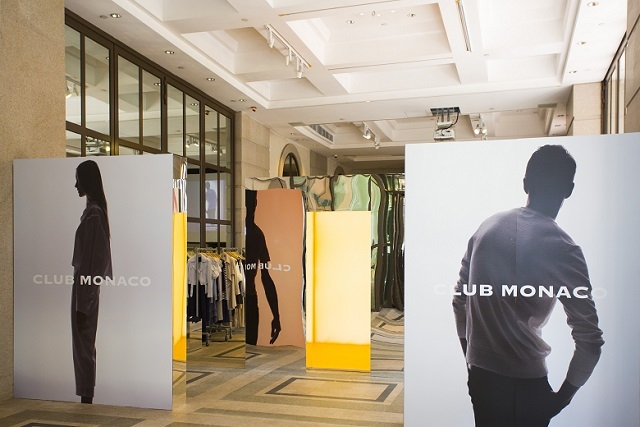 This season, the brand embraces that notion with an interactive campaign using light, shadow, and reflection to assert the Club Monaco woman and man as open and undefined and create a space for you to see yourself. In keeping with the spirit of individual expression that inspired Club Monaco’s SS18 NYFW activation, our Head of Design Steven Cateron styled, art directed, and photographed the Spring 2018 lookbook. Shot in our offices on bare-faced models, the images evoke an intentional realness as a rare first look at the collection through the lens of its creator. The Spring 2018 Collection launched in stores this February, with injections of newness continuing through June. Effortless, purposeful design forms the foundation of the Club Monaco Women’s Spring 2018 Collection. Inspired by Club Monaco’s heritage, classic prints and patterns are revisited and updated with of-the-moment details. Intentional simplicity is conveyed through styling, with a focus on iconic pieces such as crisp shirting, modern suiting, and expertly tailored trousers. “The Collection is clean and the styling de-layered, offering a renewed sense of ease and drawing focus to the key pieces that compose each look,” said Cateron. The palette is true to Club Monaco, highlighting classic black and crisp white with pops of unexpected, bold color, unified through the use of abstract print. Polka dots and pinstripes are also important, speaking to a quiet ‘80’s influence. Styling is purposefully pared back, with key silhouettes often repeated throughout the collection to reveal their versatility. Thoughtful simplicity also serves as the foundation for the Club Monaco Men’s Spring 2018 Collection. Taking a cue from the brand’s heritage, it is largely focused on menswear essentials such as the perfect pant or button-down with pared-back styling that highlights the waistline through tucked-in shirting and classic belts. “He feels effortless this season. The styling is a bit less fussy but still maintains a sense of polish,” said Cateron. The men’s Spring 2018 palette also serves as a nod to Club Monaco’s roots, focusing on the play between black and white, with intermittent hits of fresh, bold print.